Our 400-year-old medieval stone home, Le Mas Des Gardiols - La Cerisaie, sits in the heart of the Luberon amid fruit orchards, vineyards and fields of lavender, sunflowers and poppies. The Les Gardiols hamlet provides a quiet refuge just a short, turn in the road apart from the tourist throngs that descend upon southern France in the summer. Nearby, you will discover villages identified as the “most beautiful in France” and others just as remarkable. You will be within walking distance of Roussillon and Gordes, and biking to Goult. Bonnieux, LaCoste, Menerbes and Oppede are short distances by car. Imagine a private, trellised courtyard siting amid lavender, roses, cherry trees and grape vines with jasmine and spice perfuming the house and the quiet Provence evenings. The authentic country setting conveys the soul of Provence, la Vie en Rose. The home’s medieval character is thoughtfully transformed, blending the character of 17th century country life with modern comforts and appliances. Today’s features include a gourmet kitchen, modern baths, extra hot water heaters, and brand-new comfortable beds. Local wild flowers accent the authentic Provence country antique furnishings and interior appointments. For dining, French doors in the kitchen and dining room area open directly into the private, trellised courtyard which has a large stone table that comfortably seats ten. Inside, renters can share food at an antique monastery refectory table. For relaxing, a spiral staircase leads from the kitchen-dining room area up to the comfortable beamed ceiling family/living room on the second level. Here one can gaze over the property's gardens, nearby vineyards, local lavender fields, the nearby Luberon village of Roussillon, and the Luberon Mountain range. Or, one might read one of the many books and listen to your favorite music. The four bedrooms comfortably sleep eight. A master bedroom suite off the living room has private terrace, king-size bed, beamed ceilings, and private ensuite bath with tub, shower, sink, and bidet. The adjacent wing of the house is transformed into three additional sleeping areas and two baths. The wing once was a Provencal home. This ancient kitchen and family living space, is today converted into a bedroom suite with queen-size bed, a spectacular vaulted ceiling, original fireplace, and original ceramic tile floor. An additional bathroom is also nearby. Three upstairs rooms and a small study have been converted into two bedrooms and a bath. Facing this ancient home is a sitting/game room. A giant bread oven rumored, according to Hamlet legend, to have once provided bread to the entire Hamlet can be found in this room. An old well which was almost certainly used to extinguish the fires that heated the oven is attached to this oven. Today, this room space provides a shaded summer hideaway, but in the winter the old wood-cooking bread oven can still provide a warming fire and pizza.. The pool sits in a separate, private, gated rose garden area amid cherry and fig trees, oleander, lavender and rosemary. Here one can lunch under the shade of a cherry tree at a second stone table in a trellised eating area, get lost in a book, gaze at the ruby ridges of Roussillon and the Luberon range, or snooze in the shade to the songs of birds and cicadas. Food and wine here are amazing. You can’t go wrong. Eating and drinking are a big reason many visit and persistently return to Provence and the Luberon. You can visit a different Provencal Luberon village or Vaucluse outdoor market every day and cook with fresh local ingredients, have a cook do it for you, or eat in one of the world-class, Michelin star rated restaurants in the vicinity. And you need not pay Michelin prices. Small, unheralded restaurants have their own specialties The wine selection is amazing and affordable. A favorite vineyard is within walking distance, but the world-famous Chateauneuf-du-Pape just 45 minutes away and other Cote de Rhone vineyards also nearby. However, the region also specializes in Gigondas and Beaume de Venise. The art, music and theater venues available provide endless cultural options. The local villages also have their fairs running throughout the summer. Craft shows are additional options. The Mediterranean beaches are a short distance away or one can enjoy the breathtaking views from the nearby Alps or Mt. Ventoux. Barbara Egan and Philippe Mougne divide their time between Washington DC and France. A sculptor, Philippe was born near and studied art in Paris before relocating in Provence. Barbara is a native of Chicago but studied in Washington DC. The home conveys Provence's magic. The home's seductive charm, authenticity, desirable location and tranquility attracted us to the property. 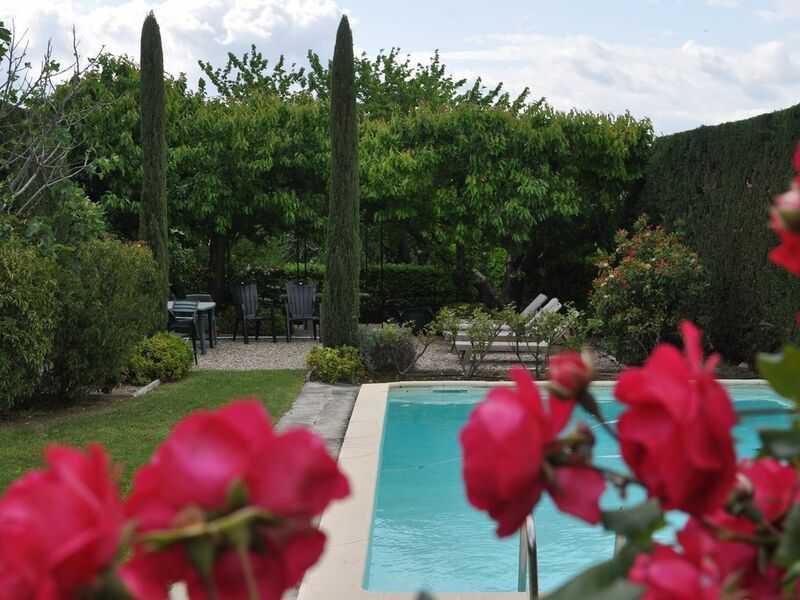 Le Mas des Gardiols is ideally located on a Luberon plateau amid all the 'most beautiful' villages in France. Yet it is a sanctuary, away from the torrent of summer tourists visiting the Luberon's more widely advertised locations. Les Gardiols residents are local, life-long residents. Roman ruins next to examples of church and French history are sprinkled throughout the region. Lavender fields, sunflower crops, vineyards, apple and cherry orchards and olive trees glorify the natural surroundings. The location is also just about an hour to the Mediterranean beaches to the south or Mont Ventoux to the North. Our home conveys the authentic, true French country living experience. Discover French country life in a true medieval home.You will become part of a small, rural French community. You're in charge. You can design your stay. You can choose to be apart from or among tourists. Dine in the flower-filled courtyard under the stars in the peace and quiet of the Luberon countryside in a hamlet that has existed since the year 900, a home that once served as the hamlet's bakery, both retaining the charm and character of old Provence. Take a short scenic walk up the hill to the perched medieval Provence village of Joucas for your fresh bread and croissants. The small Joucas market can provide all of your culinary needs. Farmers' markets occur daily in nearby picturesque villages of Roussillon, Gordes, Goult, Menerbes, and Bonnieux. Three large bathrooms. The bathroom off the master bedroom has a shower, a bathtub, and a bidet. Of the other two bathrooms, one has a shower, and the other a bathtub with a shower handle. The Mediterranean and its wonderful beaches are a short drive. You are close to the Cote d'Azur. Located in the heart of Provence, our home is in a hamlet attached to the tiny village of Joucas 1.5 kilometers from Roussillon and 5 kilometers from Gordes. Goult, LaCoste, and Bonnieux are nearby. Located in the 'golden triangle,' our home sits among the Luberon Mountains perched villages classed as the most beautiful in France. Mt. Ventoux,is nearby, the Alps a bit farther. A landline is available for your use. No air conditioning. The home's two foot thick stone walls retain the cool. We have electric radiators in each room. We provide the basic linens. We also provide linens for the pool. A large parking area is outside the gated garden area. Yes. Bring your own computer. A new, large refrigerator was installed in 2015. The coffee maker was replaced in 2017. A stove-top expresso maker, and a coffee presser is also available for making coffee. An electric teakettle is also available. The toaster is large enough for baguette toasting. The kitchen is widely equipped to support any cooking choice option. Actually several dining areas are available both inside and outside of the home. All of these seat six with the refectory table seating 12 easily. We have two DVD players and a number of DVDs are available at the house. You won't need to pack a regional travel book. We have multiple travel books, books about Provence, novels etc. We have dozens of books in English. We also have a few French standards. A mixture of music but mainly classical and jazz, or traditional French music. A large, walled swimming, yard, garden area with stone table faces the house. Two yards; one courtyard with large stone table, garden, and trellis attached to the house. Nearby tennis courts need to be reserved at the little major's office. The owner supplies hair-dryers, weekly cleaning, linens, towels, bikes. Daily groceries can be obtained from the local alimentation. The town's windmill is recently refurbished and is operational. Discover the hamlet's well at the end of the lane behind the house. Perfect choice, for a taste of authentic Provence country life. Enchanting, ancient home furnished with sturdy France country antiques. We will never forget our fantastic stay in this open and charming home in beautiful Luberon. 5 adults and 5 children (from ages 6-14) all felt comfortable and enjoyed every minute of our stay. From the inviting meal upon arrival, to the refreshing pool, to the bike paths, and the beautiful sunsets. Barbara and Phillippe did everything they could to make our stay an enjoyable one - they even recommended a cook for our last night. The home and its surroundings were terrific. It was an amazing two weeks! My husband and I spent one, too short week with two other couples in this fabulous property. The house is laid out with separate areas so each couple felt we had a private area that belonged to us. The kitchen is well-equipped and we were very pleasantly surprised to find a supper prepared and waiting for us in the refrigerator! We set out each day for a different beautiful town, exploring and picnicing along the way. We would arrive "home" in the afternoon, take a dip in the pool, laze about absorbing the delightful atmosphere! Fields of lavender were just beginning to bloom and the sunflowers were just amazing. Fruit stands with fresh and local produce, Cavillon melons, local cherries (the trees were loaded down with the crop), it was truly a wonderful time. The daily markets in the different towns were a treat to behold. Beautiful and wonderful memories to cherish...thanks, Barb, for sharing your bit of paradise!! Lovely for a Family Get-Together! Our party included 6 adults and 2 small children, ages 3 and 1. This beautiful home and surrounding area provided exactly what we were looking for for our family time together. The house and pool are great and spacious and the house is built so that the two sleeping children were away from us and not disturbed. And the tiny road the home is on is very lightly traveled--perfect for strolling children. They made friends with the two young French girls 3 houses away and were able to play with them--no language barriers! This was our first attempt at something like this and the owner, Barb, was so helpful, answering our many questions and providing lots of helpful material on the surrounding area and restaurants. She made a restaurant reservation for us and found us a babysitter also for one evening where we had a wonderful meal at La Bartavelle in Goult. The Luberon Valley is an enchanted place. Home to Peter Mayle, Sheila Hancock, the Marquis de Sade, Julius Caesar and…if you are wise…you. Barb Egan’s delightful 17th century house is on the outskirts of Joucas, on the northern slopes of the valley. From there you can stroll to the café in the village and take your café crème looking out across the stunning vista where the vineyards stretch into the heat-haze distance. There are hilltop villages to be visited: Gordes, Roussillon, Lacoste, Bonnieux, Menerbes. All of which deserve a stop for lunch in a shady café, a stroll around the narrow, cobbled streets and a slow drive back. Back to Le Mas des Gardiols - to give the house its full, correct title - to prepare a languid supper to be eaten in the private courtyard which is the real centre of the house. Cool and green, it is the perfect dining room for a Provencal evening. The house itself is full of character – no bland Spanish villa this – with corners and beams and books to read and CDs to listen to. Across the lane is your own personal swimming pool hidden from the world by shady trees; the perfect place to doze away the sweltering afternoon. Every practical need seems to have been catered for and if there is a problem, Barb will sort it out from the other end of a phone in Washington DC. The Epitome of Provencal Charm! La Cerisaie provides old country charm with all the up-to-date amenities, including a beautifully equipped kitchen amd modern bathrooms. The courtyard with stone dining table, the swimming pool and rosemary hedges, the vineyards and olive trees will remind you of Peter Mayle's beloved Provence. Staying here is the quintessential Provence experience! Activities include swimming, hiking, riding, biking, tennis, canoeing, ballooning, monasteries, roman ruins, museums, cultural and historic sites of Avignon, Aix-en-Provence, Arles, Orange, Nimes, Apt, Festivals of all types (Theater, Music, Opera, Lavender, Crafts, etc) occur throughout the summer. including the Orange and Lacoste Opera Festivals, the Opera and Piano Festivals at Aix en Provence, and Avignon's famous theater festival. Wonderful, scenic walks through ancient villages and countryside are a stones through away. And don't forget the local, traveling family circus for a true taste of Provence family life. Plus you are just over one hour away from a delicious day at clean Mediterranean beaches. And don't forget eating and wine sampling with Michelin starred restaurants and vineyards within walking distance. Local markets occur daily. Availability is subject to change pending owners receipt of deposit. No hidden fees in or potentially added to total rental fee.